I’m been hearing lots of other people complain lately, that many businesses have just forgotten about good old customer value and I couldn’t agree more. It’s been particularly frustrating and quite annoying when you hear or read about another so called new AI solution, or another challenger bank or Fintech being launched, with another 10million or 100million investment, but there is no mention of what the value is to the customer. Don’t get me wrong, I think its great that businesses are getting investment to bring new services to life, especially in Fintech where its very much needed. I can only tell you how frustrating it has been to open a new business bank account with HSBC lately to tell you how this was a pretty awful experience – as a customer of course. And I chose this route because I thought it would be easier as an existing customer already, and the idea of having to go into a branch if I were to choose Barclays was just not something that I could stomach. Really a branch – what century are we in. Banks I hope you’re hearing me here – free customer experience tips so you can map your new customer journeys. And now that my account is finally opened, its pretty much a simple bank account with statements and transactions, and a fee I have to pay too for a rather basic service – not rocket science really. Ok, HSBC threw in free banking for 18 months as the account is for a new small business customer – great they care – yeah. And I have opened three of these bank accounts with HSBC but each time the experience has been different – why is that? There was actually a pretty good one about 3 years ago and it seems to be getting slower with little to no change in that time, rather than improving as I would have expected in this digital age. I hate that I have to rant – so sorry for that – but my point here is that while there are lots of new Fintech driven banking services available, I still chose to bank with HSBC because as a customer, I still can’t see what the difference is when it comes to the bank account. There are other options yes, but they are not providing the customer, me in this example, at least not yet with a better customer experience – or I am not aware of these new services and what special experiences they provide. I have tried a few other services too, and I can’t say its that much better. Metrobank UK took almost a month to respond to my email to open a bank account. Apparently I can get the same day service if I went into a branch, but there lies the problem. I don’t want to use a branch. It takes time to travel to a branch and then I’m in queue – why can’t we do everything online or digitally? Metrobank let me bring my dog into their branch in Wimbledon, but after waiting about 20mins in the branch while they fed my dog some yummy biscuits, to then be told that they couldn’t solve my problem and that someone else needed to contact me directly the following day, I can’t say that was a good experience either, at least not for me – BUT I think my dog loved it. I have read so much about how some of these new challenger banks are using new technologies and AI in their services, but so what? I’m in the industry of AI and I speak about it at conferences and advise on it. AI as a technology is great, but its all a little pointless if the issues I face as a customer to have seamless banking services, where I do a little as possible and have my time back as a busy entrepreneur running a business, are not available to me. If AI can automate everything that seems to be taking up necessary time from customers – then wonderful – but that has not happened yet – anywhere. As a Fintech consultant, I really hope that the new PSD2 regulation is going to change things and provide transparency and visibility into my finances and drive change in the entire banking industry to focus its attention on the customer journey. I’ll mention some of these new services later in this blog. WHAT IS THE CUSTOMER JOURNEY THAT DELIVERS CUSTOMER VALUE? Before I do that, I want to be clear on what this is – the CUSTOMER JOURNEY – as there was a little confusion recently when I ran one of my Operating Model Transformation courses, with a few bankers in London. These were some of the smartest guys in the industry and they have come onto my course to genuinely learn how they can transform their organisations operating model to improve their businesses, and to increase profit growth while being more operationally efficient. But what happened on the course was evidence of how they have been going about it all wrong – not maliciously or intentionally of course. The problems lies in their understanding, their thinking and default behaviour around the customer journey. We conducted a customer journey exercise to design the new customer experience of the next generation digital bank, and most of the participants, not just the bankers struggled. They struggled to think like the customer, to really understand the goals of the customer in their everyday personal or business lives, and how they wanted to experience and use the new digital services. These desired customer services really have nothing to do with the normal banking services like opening accounts and transactions. The customer of a bank wants these standard services, but we prefer these things to be seamless or if possible invisible. Of course the participants, and especially the bankers got stuck discussing the banks internal customer onboarding processes, and how things worked today, rather than what customer onboarding really means to the customer, and what the customer really wants. The Customer Journey is the ‘outside in’ view of how a customer should experience a service that is to be provided and delivered by a business or organisation. It is the customer’s own personal experience that may form apart of something that they want to do in their everyday life. It is not the ‘inside out’ view of the processes that a business and organisation needs to action in order to deliver the service to the customer – this is the Value Stream. For the customer, onboarding is whether they should adopt the service and use it, to keep it in their portfolio of services that they want to use repeatedly. Customer journey design is all about solving the problems and meeting the goals that mean something to the customer, and not about the process of doing credit checks and verification of ID, etc… in order to open that bank account for the customer, which is what the participants and especially the bankers were concerned about. Of course these things are important, and with tighten regulatory pressure which all banks have to deal with, these things need to be taken care of in the background. But for the customer, its all about having a service that is so engaging or seamless that it leads them to adopt the service. Its all about making the service STICKY. This stickiness applies to all services in the digital world that we live in, not just banking services. I’m glad to say that everyone in the course did successfully design a great new customer journey for a digital bank, which led them to design a some really innovative services. It’s funny when people start to think about what they want from banks from the customer’s perspective what they come up with. On the course, we had new ways of interacting with banks such as via skype calls, lots of new data and research services that would relate to someone’s job and investments, as well as new tools and apps that had nothing to do with banking, but where a bank account or a loan was the last part of the customer journey – like a Real Estate app or financing a laptop or your new iPhone X. Well, its looks like DBS is offering the skype service, CBA has implemented the CommBank Property App, Hitachi Finance is in partnership with John Lewis to finance laptop purchases and Barclays are working with Apple UK to provide finance for new phones and upgrades. I can’t be sure if any AI or Blockchain has been incorporated into any of these services without digging deeper. These are just smart services and not all of them are necessarily new, but they are appealing to many of today’s customers and certainly more customers in the future. They are just a handful of the many examples of great and/or new services offered by the Fintech and Digital Banking revolution. Most of us today, are all using Paypal, Stripe and other apps like Transferwise, who provide excellent alternate services for payments and foreign currency transfers at much cheaper prices, to complement our bank accounts. And today these three Fintechs are no longer startups but Unicorns worth billions. That transition from the customer journey and into service design that incorporates what to then change in the operating model of a business, including what to START, STOP, or KEEP DOING, or CHANGE, led to many aha moments on my course, from the feedback received. During the service design part of the course, the participants were able to apply the appropriate shiny technology solutions to the new customer journeys they had designed, including how they would hire new data scientists and develop AI solutions or use blockchain to support the operating model by storing everything with an audit trail… They were able to see exactly what resources, including people, processes, data and systems, needed change and/or improvement. They were also able to review the maturity of the current operating model of the case study they were given, a dinosaur-like made-up bank naturally, conduct a gap analysis, and look at what new capabilities were really needed, including how to use technologies like AI, Big Data and Blockchain as enablers to support the new services. If I was running as successful Fintech or wanted to start a new Fintech business, I’d be looking at these gaps along the value chain of the new banking and financial services industry, to make sure my latest services, deliver on this desired customer value. And again, this applies to any other industry too. I’ll be exploring these in my book, THE STRATEGY JOURNEY. There are many opportunities still to be taken. That’s what disruption and innovation is all about. This gap between Design Thinking and Service Design – that is, how to link it – to move from a pretty diagram that outlines the idea – so still very conceptual, to a logical sequence of actions in which to apply and change via the Operating Model and the Transformation Model with the customer journey as the key focus – is covered in my Transforming Operating Models with Service Design course and in my book, THE STRATEGY JOURNEY. What’s most important is the thinking and behaviour in organisations behind the customer journey. This is what I want to change across the entire business transformation or change management industry and in HOW businesses are actually run. 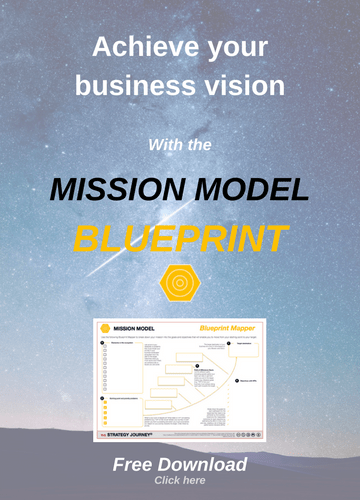 Its about building business agility to be ready for constant change via the operating model, in order to deliver value based on the customer journey. Its about how to bring an agile mindset and build a customer centric-culture into a business. In THE STRATEGY JOURNEY book, I discuss 5 models that join forces to help businesses and organisations navigate their business journeys, along with many more case study examples, covering small businesses, high growth tech startups and large corporates. You can watch the video on THE STRATEGY JOURNEY framework, to find out more about the 5 models. The VALUE model, which I have previously written about, is the secret ingredient at the heart of the whole framework… and where I believe there is a gap in many businesses and organisations, both big and small, who are sometimes too busy building or implementing shiny new tech, rather than being focused on delivering customer value via the customer journey. In the long term, value comes from the customer journey, including the people who have been impacted, the processes experienced, the data transacted and collected, and the systems used, which can then be improved. This is how we should all be innovating in the digital age – to execute digital transformation.